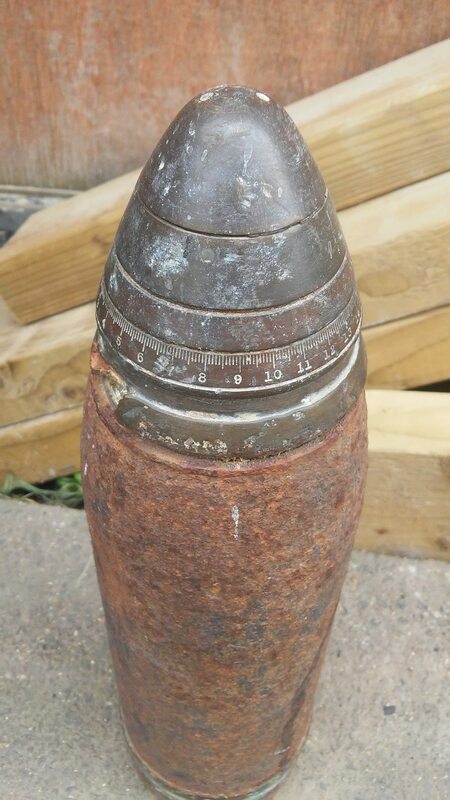 Workmen came across more than they bargained for when called in to clear a garden – and discovered an artillery shell in the undergrowth. The bomb disposal squad were sent to the property in Wolverhampton yesterday. They found a First World War shell which was empty of explosives after X-rays were conducted on the 100-year-old piece of ammunition. The shell, with a brass head, turned up in a garden in Ashmore Park during a clearance. It was taken away for safe disposal by the team. Police also attended the property and tweeted pictures of the shell, cylindrical in shape with metal casing. In warfare, they contained an explosive charge and a projectile for firing from a large gun. Artillery developed rapidly during the Great War of 1914 – 18, with the almost constant shelling by all sides on the Western Front.